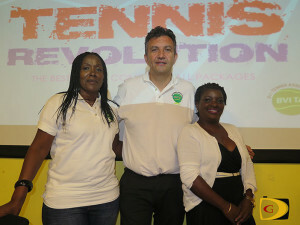 BVI Tennis Association president Carol Mitchell, left, Mike Barrel and public relations officer Dionne Liverpool. It certainly won’t be the typical way we see the sport of Tennis. An ‘outside the lines’ approach will be the basis the BVI Tennis Association’s Tennis Revolution project which will be done in conjunction with the BVI Olympic Committee, where hitting the ball with a frying pan or using Police restricted area tape for a net, literally adapts the sport to any environment. Consultant Mike Barrel, BVI Tennis Association president Carol Mitchell and public relations officer Dionne Liverpool, shared the plan that will come on stream in September, during a press conference last week. Barrel who has work in 87 different countries around the world with the sport, says in driving around Tortola, he noticed there are lots of playgrounds and learnt that there are only 10 tennis courts on the island, two of which are public courts. At the school level, the program is interwoven in all aspects of the curriculum. Barrel explained that they are not going in to talk about tennis, which is integrated into math, geography and other subjects. Barrel who met Mitchell three years ago at a conference in Mexico, said they had discussed the sport in the territory and looked at a program before, but it wasn’t a fit for the BVI. Mitchell, just shy of a year at the helm of the association, has been working diligently in getting the sport at the grass roots level. She said her aim to bring more awareness and have more kids and adults getting into the sport and growing the sport overall in the territory.